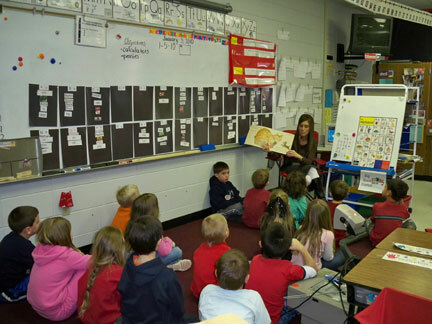 I started out the new year in Greenwood, Arkansas on a return visit to Westwood Primary. On my last trip there in June, we set up a first grade classroom together and made over the space in a day. We also learned about literacy work stations. Boy, did these teachers put it into action! A big thank you to all the awesome teachers at Westwood Primary! Fourth graders sit on the floor in the whole-group teaching area to read a story from Tumble Books together. Recently, an upper grade teacher told me she couldn’t have a whole-group teaching space where kids gather close to her, because she uses a document camera or projection device. She told me her students need to stay in their desks to see what’s projected on the interactive white board. 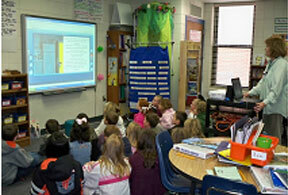 Yes, there are times when you might want students to stay at their seats when teaching with this kind of technology. For example, when teaching a math lesson with manipulatives, I often have kids sit at their desks or tables while I model with the document camera. 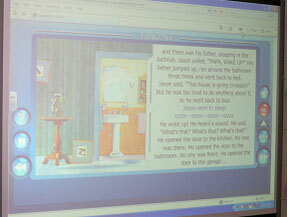 But there are other times, such as those on the pictures, where I bring students up close to read something together. They simply sit in front of the screen. This enables us to feel like a part of a group, or a community of learners. Tumble Books highlights words being read aloud in blue. Kids can read along with the text. I love having a whole group teaching area, even with older students. They like to sit together on the floor for a change of pace. And, by being closer to the teacher, are often more engaged in the lesson and learning. By the way, in this class, they were using Tumble Books. Teachers told me that they shared this new technology with parents in conferences. Some of their parents who didn’t have the Internet at home told teachers they were going to get the Internet just so their children could read using Tumble Books at home, too. The power of technology! One word for the teaching I saw in Cabot… WOW! What wonderful classrooms I visited. It was hard to tell the difference between the special education rooms and those that weren’t. The only difference was smaller class size and more adult support. It was an amazing visit! Photos below tell the story in some of the upper grade rooms I visited. More to come on primary classrooms later. 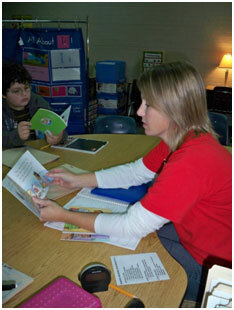 Guided reading group meets in special education classroom. Teacher uses tools on table for focused teaching. 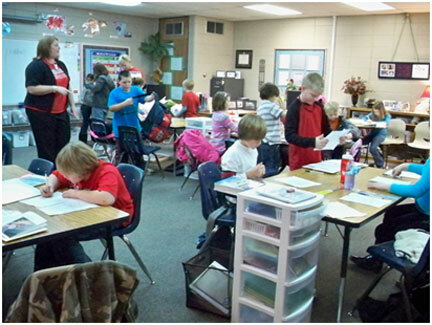 Whole group teaching area in 4th grade. Note the use of dry erase boards hung on wall in the area. 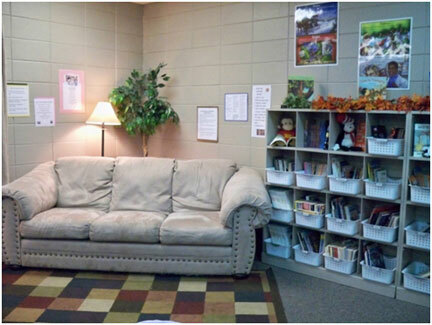 Wouldn't you love to curl up and read a good book in this 4th grade classroom library? 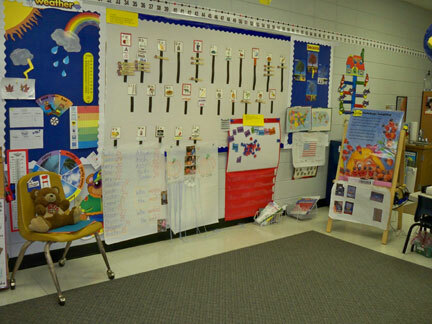 Today we’ll look at classrooms just for Pre-K and K students. While visiting Ford Elementary in Denver, I saw great things set up in spaces for the youngest learners. Their 4-year-olds are in an ECE room. Kindergarten is housed in another classroom. Such kid-friendly environments! Everything was just the right size for little ones. 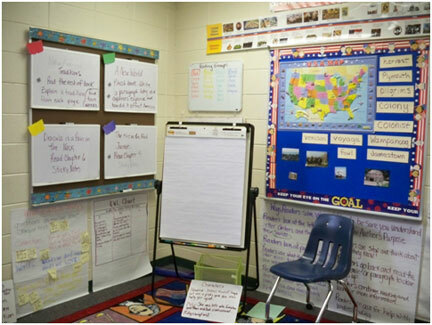 The word wall was low, interactive, and in the whole-group teaching area so students could easily see and manipulate the new words they are learning. Libraries were inviting. Children were comfortable in this space designed just for them. This past week I visited Ford Elementary in Denver, CO. Teachers there are committed to creating welcoming classroom environments. We visited classrooms from ECE (4-year-olds) to 5th grade and moved a bit of furniture along the way. 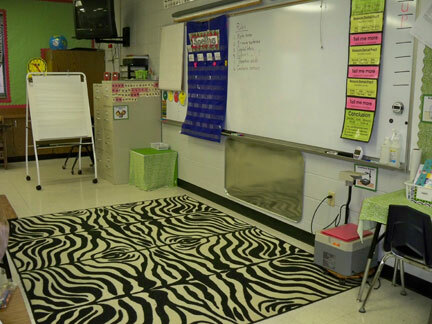 I recommend starting with classroom environment at the beginning of the year. It sets the foundation for all the teaching we will do throughout. When we have a well-organized whole-group teaching/meeting area, it is easier to help students focus on what we are teaching. Likewise, a smal-group teaching area (with everything we need at our fingertips) helps our small-group lessons stay focused and within our time budget. We can minimize interruptions and distractions. One thing to keep in mind is to be sure you can easily see every child in the classroom from your small-group table. A third space to focus on at this time of year is your classroom library. Does it invite students in to read a book? Is it easy for children to choose just right books and return them to the library for others to easily find? Does the library support reading comprehension, too? You might have a set of fiction shelves and a separate set of nonfiction shelves to get students thinking about genre. While doing back to school inservice at Mt. Penn Elementary Center in Antietam School District in Reading, PA, a few 6th grade teachers asked me to peek in their classrooms. I saw some lovely classroom libraries! One teacher had organized books with a fiction section and a separate nonfiction section, as I suggest in my book, Practice with Purpose. The other has a well-defined, comfortable space set up and will have her students help organize the books next week when they return to school. Labels on baskets help students find and return books easily. Would love to see pictures of your classroom library if you have one! Send them to d.diller@live.com and I will post them. Make sure that you include your name, where and what you teach, and a short description of your library. We worked together last week to give Polly’s classroom a whole new look! She said that last year she moved things around every few weeks, but it never really felt right. We started with a plan for instruction, and that makes all the difference. As part of our summer workshop in Ozark, we met in Polly’s room and mapped out the classroom with her. Teachers gave suggestions for furniture placement (and the “why” behind their reasoning), and then Polly and I planned where to place each instructional space. Together, we moved all the stuff. We changed the color scheme in the room to make it flow, too. This is the first room where I’ve used black as a background on bulletin boards. I love it! The charts Polly hangs will really show in this new space. The built-ins are a funky color, so that’s why we used black and white with it. Now Polly’s room is ready for instruction, and she shouldn’t have to move furniture around at all. Take a look at these before and after pics! Remember the old whole-group area? And at last, look at these great new bulletin boards!